Are wondering if you should make the switch to a tankless water heater? Yes, you should! What is the point in having a big tank of water sitting in your basement constantly heating when you can have an efficient tankless system? There are so many benefits to choosing a tankless system that one can’t help but wonder why more people haven’t converted to one yet. The advantages vary from increased energy efficiency to lower heating costs, a longer life expectancy on the system and, of course, saving space. Saving on energy with a tankless water heater means that you save on costs. There’s no water to be heated in a tank wasting energy. The system heats it instantly, as and when required, so there’s less energy used in the process. Most traditional water heaters last around 15 years (highly dependent on make, model and maintenance efforts). Your tankless water heater, in comparison, will be with you for around 20 years. That’s a good investment! Most tankless systems qualify for a federal rebate. Tankless water heater maintenance is far less intensive than that of a regular water heater. 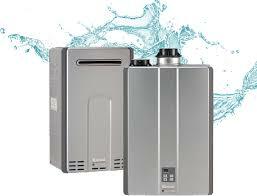 Tankless water heater repair is also typically easier than that of traditional heaters. Most households save up to 20% on their monthly heating costs with a tankless water heater. There’s no risk of flooding when you use a tankless water heater system. This is great for household insurance. Are you tired of spending more than you need to on water heating costs? Are you tired of having access to a limited supply of hot water? Then a tankless water heater system could be the water heating solution for you. We can help. For more advice, contact us at Hot Water Now or look at our FAQ page today.